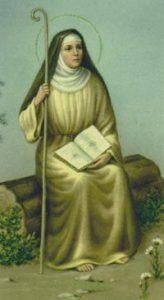 St. Monica was married by arrangement to a pagan official in North Africa named Patricius, who was much older than she, and although generous, was also violent tempered. His mother lived with them as was equally difficult, which proved a constant challenge to St. Monica. She had 3 children; Augustine, Navigius, and Perpetua. Through her patience and prayers, she was able to convert her husband and his mother to the Catholic faith in 370. Perpetua and Navigius entered religious life but St. Augustine was much more difficult, he was a wild child. And she prayed for him for 17 years until he was drawn to faith and canonized as St. Augustine, one of the church’s greatest teachers and philosophers. She is the patron saint of homemakers, married women, mothers, victims of abuse, widows, wives and disappointing children. Her patience and persistence helped others find their way to the Lord. Exemplary Mother of the Great Augustine, you perseveringly pursued your wayward son, not with wild threats but with prayerful cries to heaven. Intercede for all mothers in our day so that they may learn to draw their children to God. Teach them how to remain close to their children, even the prodigal sons and daughters who have sadly gone astray. Dear St. Monica, troubled wife and mother, many sorrows pierced your heart during your lifetime. Yet you never despaired or lost faith. With confidence, persistence and profound faith, you prayed daily for the conversion of your beloved husband, Patricius, and your beloved son Augustine. Grant me the same fortitude, patience and trust in the Lord. Intercede for me, for (your petition) and grant me the grace to accept his will in all things, through Jesus Christ our Lord, in the unity of the Holy Spirit, one God forever and ever. Amen. Class Hours: 9:00 a.m. - 3:30 p.m.